Ok, how fabulous is this dress? The gold buttons at the shoulders, those puffed and gathered sleeves, the delicately pleated bodice, that belt. And all on an utterly versatile navy blue canvas. 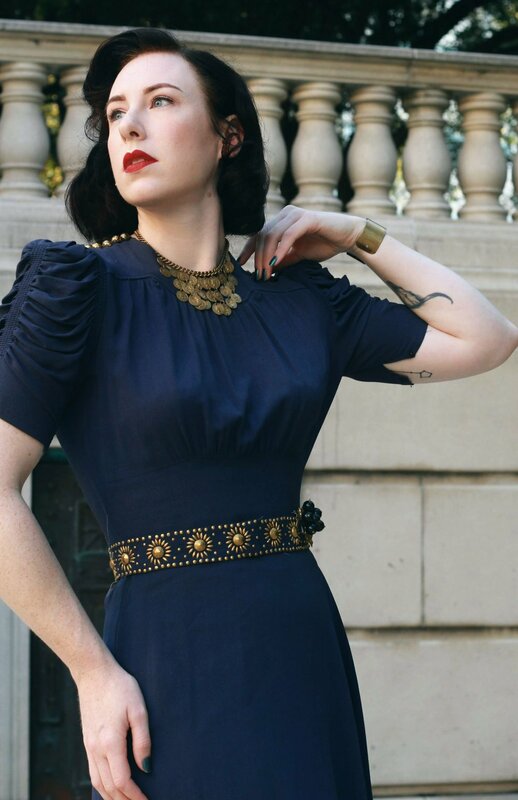 If you’re into 1940s fashion, this dress is pretty hard to beat. I wanted to really lean into the metallic accents, so I went a bit bolder with the accessories than I normally do. I’m always looking for an excuse to wear this gold coin necklace, and I think this dress is probably the best pairing that I’ve made with it so far. I also added a cuff bracelet and a blue and gold dress clip that reminded me of fall. The gold shoes were kind of a random purchase last year, and while I don’t wear them often, I was happy to dig them out of the closet for this dress.